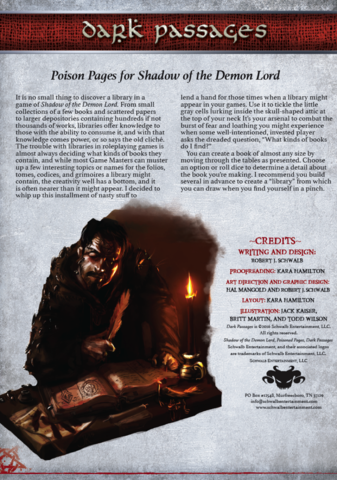 The Poisoned Pages series finds new ways to expand the game by adding ancestries, paths, optional rules, and more to Shadow of the Demon Lord! As Unhinge the Mind expanded the rules for insanity and madness, Battle Scars provides a set of optional rules that amplify the existing damage rules to present a grittier game, where injuries sustained in the course of an adventure can have lasting consequences. The rules do not simplify the game or make it any easier to survive. In fact, they turn what is arguably a challenging game for characters to survive into a potentially lethal one. However, they act as a wellspring of ideas for building and developing the characters’ stories as the venture through a dangerous and dying land. The spread of the Demon Lord’s shadow has triggered calamities and catastrophes that have upset the natural order of things, such that havens have become tombs, cities awash with blood, and monsters loosed in the countryside. No longer can people huddle in the dark; the time for hiding has come to an end, for the Demon Lord will devour all as it destroys the world. So, as the salamanders have begun to descend from their fiery peaks, so have the gnomes been dislodged from their cavernous homes to emerge blinking into the world they abandoned long ago. 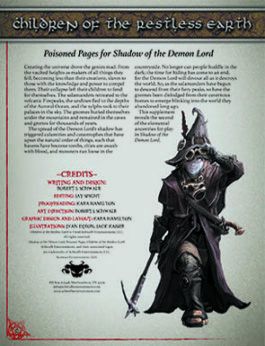 This supplement reveals the gnomes, the second of the elemental ancestries for play in Shadow of the Demon Lord. 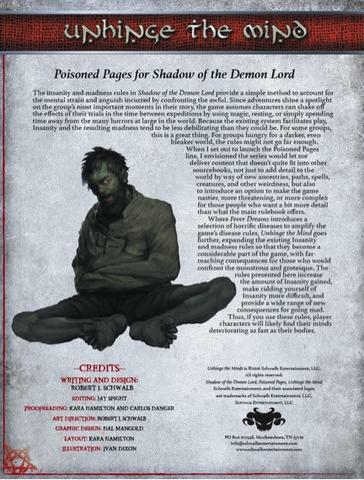 The second installment of a new series of short, focused game expansions for Shadow of the Demon Lord, Fever Dreams gets down and dirty with eleven nasty and terrifying plagues. 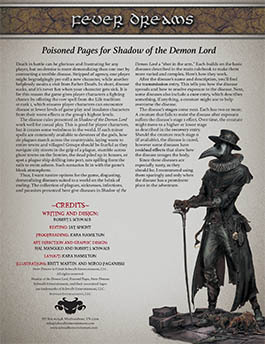 Expanding on the rules presented in the main book, any of these diseases could be the centerpiece of an adventure or an entire campaign! The gods forbid the eating of other sentient creatures and punish those who violate the taboo with a horrid curse. Such consumption almost always triggers a transformation into hideous ghouls. As a game of horror fantasy, player characters in Shadow of the Demon Lord confront awful choices, sometimes having lasting consequences. 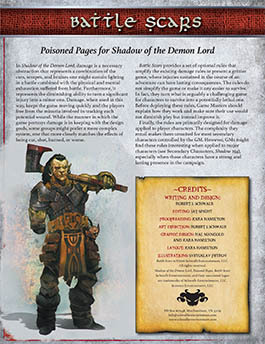 “Flesh of the Fallen” delves into the sinister by exploring options for characters who would steal power from fallen foes and the risks they face from doing so. The centaurs make no claim on the Endless Steppe. Rather, they see themselves as its protectors chosen by the spirits of the plains to preserve the lands against the invader, to keep their lands pure, sacred, and free from the rapacious humans who would transform it to suit their needs. Thus the centaurs roam the Steppe, watchful for interlopers from beyond the mountains so they can drive them back as they have so many times before. 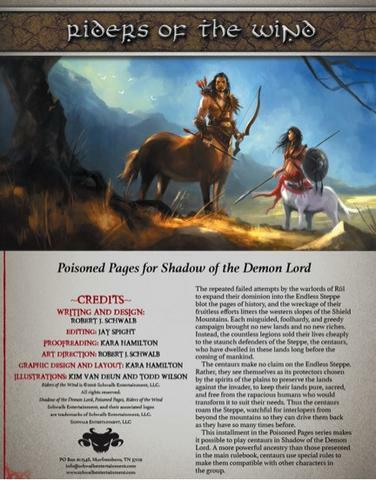 This installment in the Poisoned Pages series makes it possible to play centaurs in Shadow of the Demon Lord. 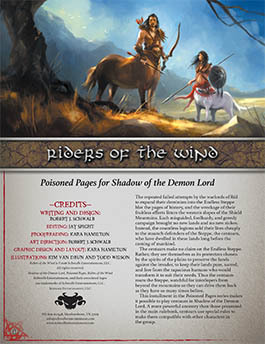 A more powerful ancestry than those presented in the main rulebook, centaurs use special rules to make them compatible with other characters in the group. We all wear masks. We wear them to conceal our true selves, to become what others expect us to be, navigating the murky waters of social interaction to forge relationships, find love, and avoid enemies. For most of us, masks conceal uncertainties and doubts, ambitions and desires, and all the little secrets that make up what we think of as our true selves. For a few, masks conceal darkness, a dangerous beast just barely restrained by the chains of self-control. Sometimes, the chains break, the mask slips, and the horror begins. 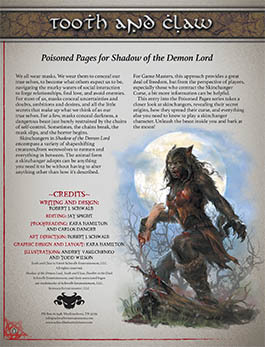 Skinchangers in Shadow of the Demon Lord encompass a variety of shapeshifting creatures, from werewolves to ratmen and everything in between. The animal form a skinchanger adopts can be anything you need it to be without having to alter anything other than how it’s described. 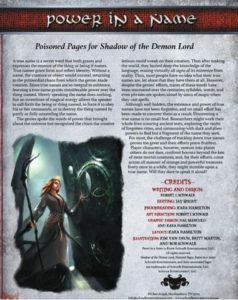 For Game Masters, this approach provides a great deal of freedom, but from the perspective of players, especially those who contract the Skinchanger Curse, a bit more information can be helpful. 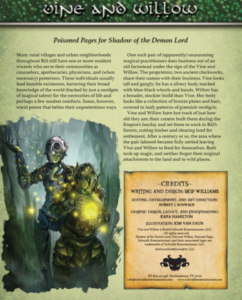 This entry into the Poisoned Pages series takes a closer look at skinchangers, revealing their secret origins, how they spread their curse, and everything else you need to know to play a skinchanger character. Unleash the beast inside you and bark at the moon! Unhinge the Mind expands the existing Insanity and madness rules so they become a considerable part of the game, with far-reaching consequences for those who would confront the monstrous and grotesque. The optional rules presented here increase the amount of Insanity gained, make getting rid of Insanity more difficult, and provide a wide range of new consequences for going mad, including short-term and long-term madness. 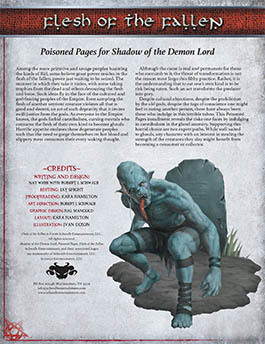 Using the rules in this Poisoned Pages entry will drive your player characters crazy! 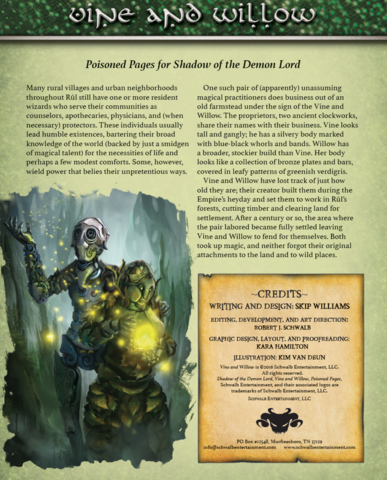 Vine and Willow, a pair of clockworks devoted to nature and the Old Faith reveal the secrets of natural magic. 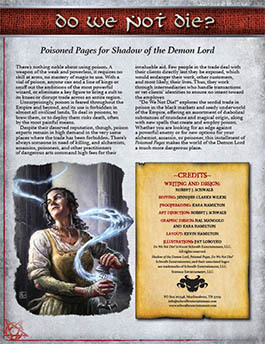 This entry into the Poisoned Pages series reveals a bevy of new spells and potions to enrich you games. Will you bargain with these strange fellows on the tattered fringes of civilization? 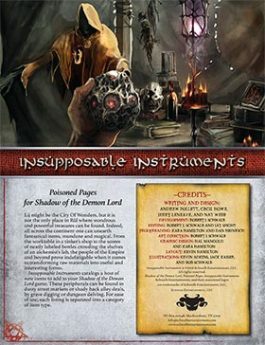 The first installment of a new series of short, focused game expansions for Shadow of the Demon Lord, Dark Passages gives you a set of fun tables to help you stock libraries and other depositories of books the player characters might stumble across as they explore the world of Urth.